Mega Fortune is a popular video slot, thanks to its enormous Mega progressive jackpot. Furthermore, there are another two progressive jackpots to be won. 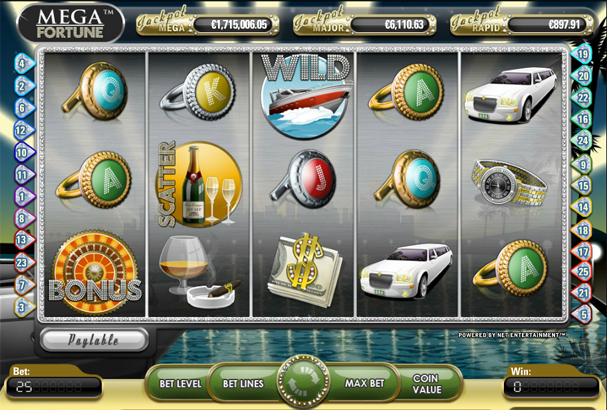 The theme of the game is millionaires, where pictures of yachts, jewels, champagne, cigars and limousines adorn the reels. Additionally, Mega Fortune offers a free spin bonus round and the Mega Fortune bonus game, where you spin the wheel to play for one of the three progressive jackpots. If you want to play for real money, then Betsson Casino is the place for you. This online casino welcomes you with a 100% bonus on your first deposit. If you deposit £100, this means you’ll receive a bonus of £100! Three scatter symbols give you access to the free spins mode. This bonus round is especially profitable thanks to the multiplier, which can multiply your winnings by five! Collect further scatter symbols to receive even more free spins during this bonus round. With Mega Fortune, you determine the value of the coins. Bet between one and four coins per payline, and set the coin value yourself (from €0.01 to €0.50). The maximum bet per spin is €50. Bet four coins on each of the 25 paylines to play for the biggest progressive jackpot. Mega Fortune has two different scatter symbols: the Mega Fortune wheel and the and the champagne magnum with two glasses. Three Mega Fortune wheels will give you access to the Mega Fortune bonus game. Scatter symbol Three or more champagne magnums give you access to the free spins bonus round. Scatter symbol Three or more images of the Mega Fortune wheel give you access to the Mega Fortune bonus game. Wild symbol Replaces other symbols when creating winning combinations. The bonus wheel consists of three smaller wheels with arrows and cash prizes. Should the outermost wheel stop on an arrow, the second wheel will start to spin. The second wheel also consists of cash prizes and arrows. The third wheel begins to turn after the second wheel has stopped on an arrow. With the second and third wheel, you also have the chance to play for the mega progressive or the rapid progressive jackpots. You go away with the mega progressive jackpot if the innermost wheel stops on the arrow. Mega Fortune made history on January 20, 2013, after an online gambler won a jackpot of €17.8 million. As a result, the slots player got into the Guinness Book of Records, as the enormous jackpot set a new world record in the world of online gambling. Spin the wheels of this popular slot and play for a chance of one of the three progressive jackpots. This jackpot slot will whisk you away to the world of millionaires!